CVMR® delegation from Canada and China visited the Republic of Burundi to discuss their Pre-Feasibility Study on Mukanda with the officials of the Ministery of Hydraulics, Energy and Mines and to map out their full Feasibility Study for Mukanda, Waga and Nyabikere mineral concessions. A delegation of executives from La Société CVMR Energy Metals Burundi SURL (CVMR®) headed by Kamran M. Khozan, Chairman and CEO, arrived in Bujumbura on the 30th of November 2018. This was the third time the executives of CVMR® have visited Burundi. Mr. Nanthankumar Victor Emmanuel, P.Eng., Chief Operating Officer of CVMR®, and a team of geologists from China accompanied Mr. Khozan. Another team of six geologists and mining engineers will follow after the Christmas holidays. The delegation met with the Right Honourable Pierre Nkurunziza, President of the Republic of Burundi, the Honourable Côme Manirakiza, Minister of Hydraulics, Energy and Mines and officials of the Ministry to discuss the Pre-Feasibility Study on the mineral concession of Mukanda that was submitted to the Burundi government in April of this year. The delegation visited the mineral concession of Nyabikere in order to map out the upcoming full Feasibility Study due to start in the first quarter of 2019. La Société CVMR Energy Metals Burundi SURL (CVMR®), is a subsidiary of CVMR Energy Metals Inc., of Canada. The Cabinet of the government of Burundi approved and awarded the mineral concessions of Mukanda, Waga and Nyabikere to CVMR®. The Right Honourable Pierre Nkurunziza, President of Burundi ratified the final decrees of Waga and Nyabikere concessions on the 14th of September 2018. To date, CVMR® has spent over $40,024,000.00 US dollars on the Pre-Feasibility Study and Feasibility Study of these concessions. Mukanda has an estimated market value of $2 billion US dollars in proven reserves of vanadium and titanium, which cover an area of 144 square kilometers. Two previous surveys conducted by the United Nations and later by a Swedish mining company had confirmed a total of 6,500,000 metric tons of vanadium “Proven Reserves,” 7,300,000 metric tons of Probable and 5,000,000 metric tons of Possible, vanadium reserves. The Pre-Feasibility Study of Mukanda was completed with the participation of Jacob Mining Engineering. It forecasts a net cash flow of over $1.6 billion US dollars over 10 years at a capital cost of approximately $250 to $300 million US dollars. 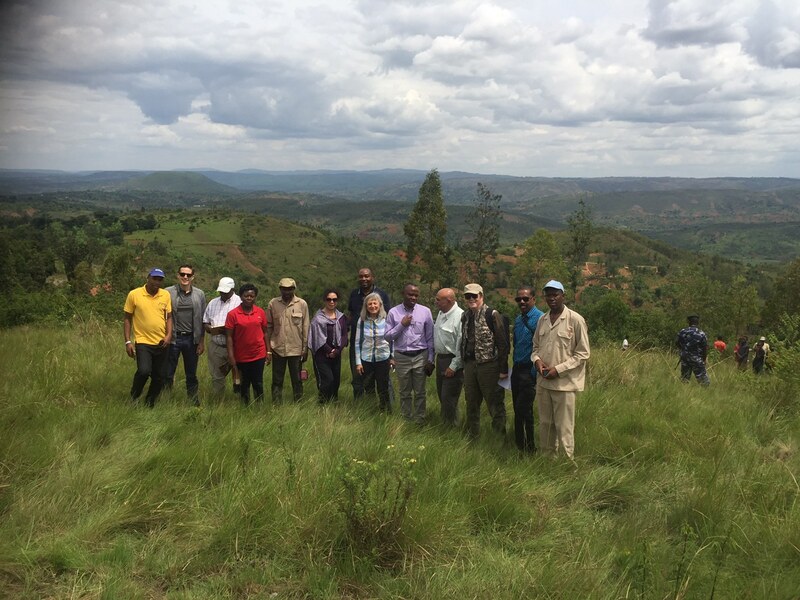 The result of the Pre-Feasibility Study for Mukanda was sent to the Ministry of Hydraulics, Energy and Mines of Burundi for their review and evaluation. The Pre-Feasibility Study was approved by the Burundi government and CVMR® was given the green light to proceed with a full Feasibility Study in accordance with “NI 43-101” standards of Canada in September 2018. Although CVMR®’s Pre-Feasibility Study on Mukanda confirmed the accuracy of previous findings of its mineralization, the surveys will have to be repeated once more in accordance with NI 43-101 regulations. CVMR® will be using the expertise of DRA Global Engineering and Jacob Mining Engineering to complete the process. Jacob Mining Engineering’s representative in Burundi confirmed the receipt of funds ($40,024,000 USD) from CVMR® to complete the Feasibility Study for the concessions. Waga and Nyabikere jointly cover some 218 square kilometers of land and have a total estimated reserve of 1,088,000 metric tons of nickel, 25,200,000 metric tons of iron, 30,000 metric tons of cobalt and 17,800 metric tons of copper at a total estimated current value of $30 billion US dollars. CVMR® estimates that the total cost of the Feasibility Studies for the three concessions will top $60 million US dollars. CVMR® team with the Honourable Côme Manirakiza, Minister of Hydraulics, Energy and Mines of the Republic of Burundi and officials of the Ministry at the Nyabikere site. 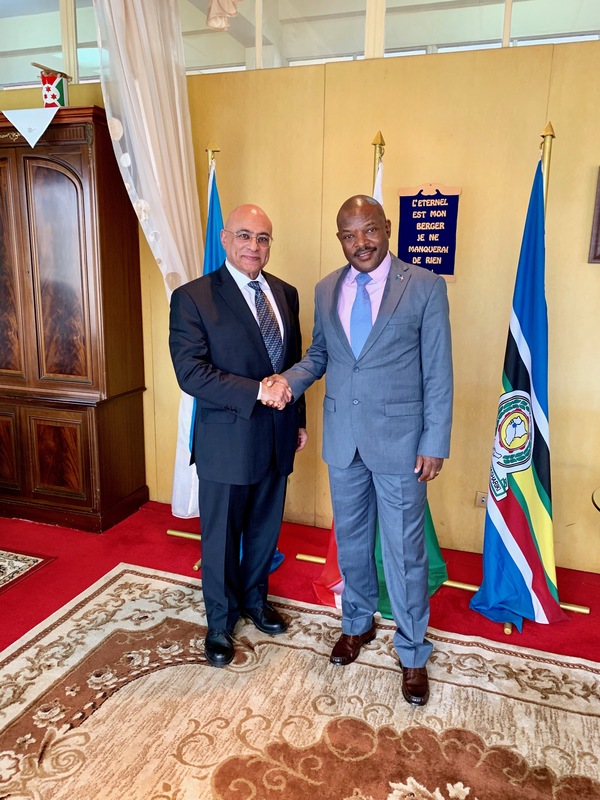 Kamran M. Khozan, Chairman & CEO of CVMR® with the Right Honourable Pierre Nkurunziza, President of the Republic of Burundi. In the past five years CVMR® in cooperation with one of its wholly owned subsidiaries, M-Power® Corporation, has been developing state of the art battery components that produce batteries that are efficient alternatives to the current rechargeable batteries, creating a new paradigm in energy storage. The minerals in the Burundi concessions (nickel, cobalt, vanadium, copper) are essential for the manufacture of such batteries. Off grid intermittent energy sources, such as solar, wind and wave, require effective, inexpensive and efficient energy storage. Power storage backup systems are essential for uninterrupted delivery of electrical current, load levelling and grid energy storage systems. The massive expanding market for electronic cars and other devices requires a variety of different batteries with varied storage and discharge capabilities. According to the Chinese government’s official statistics the market projection for Vanadium Redox Flow Battery demand (in Megawatts) in the top 10 countries, has been and is growing, at 80% CAGR (Compound Annual Growth Rate) from 2013 to 2020, ultimately culminating in more than 7,000 MW of vanadium-flow capacity needed in 2020. CVMR®’s research has been focused on Vanadium, Manganese, Magnesium and Lithium-Ion batteries which also use nickel, cobalt and graphene, all refined and produced by CVMR®. Its Vanadium energy storage systems are designed to be modular and able to discharge at a pre-set rate, rapidly or slowly, depending on the requirements of the user. Their charging time is less than five minutes, with a cycle life of over one million cycles, round-trip efficiency of 99% and low cost of manufacturing. They can be used in commercial, residential and industrial applications, microgrid systems, remote locations, refrigerated mobile containers, mining camps and telecom towers. In certain models CVMR® has successfully substituted magnesium for lithium. Vanadium has many other uses, about 85% of produced vanadium is used as ferrovanadium or as a steel additive. Titanium-aluminum-vanadium alloy is used in jet engines and body parts of high-speed aircraft. Its steel alloys are used in axles, crankshafts, gears and other critical components. Vanadium alloys are also used in nuclear reactors because vanadium has low “neutron-adsorption” abilities and it does not deform in “creeping” under high temperatures. Vanadium foil is used in cladding titanium to steel. Vanadium-gallium tape is used in superconducting magnets. Vanadiumpentoxide is used in ceramics and as a catalyst for the production of sulfuric acid. CVMR® is a Canadian company that has developed refining processes and technologies that can refine some 36 metals, using its proprietary vapour metallurgy processes. CVMR® is capable of refining iron, nickel, cobalt, copper, lithium, manganese, magnesium, tantalum, the platinum group of metals, gold, silver, titanium, vanadium, molybdenum, and seventeen rare earth elements. In the past three years CVMR® has been able to produce graphene and graphite by: (i) refining of graphite-based minerals; (ii) decomposing methane gas; and (iii) capturing CO2 emissions. The company has a highly competent team of scientists and engineers who have consistently proven to the market that they can think out of the proverbial scientific box and come up with highly profitable ways to tackle seemingly unsolvable technical problems. CVMR® is a world leader in the production of metal powders, nano-metal powders, sub-nano-powders and super alloys with substantial profit margins compared to the LME and other standard market prices. It has revolutionized a 110-year old metal refining process known as the “Mond Process” or the “carbonyl process” when applied to nickel and iron, and generically known as the “vapour metallurgy process,” when applied to other elements. CVMR® has managed to extend the vapour metallurgy process to 36 different metals by the use of different reagents (chemical vapours). CVMR® drives its corporate name from the acronym for Chemical Vapour Metal Refining. It has offices in Canada, China, USA, UK, UAE, Turkey, Burundi, the Philippines, and is active in 18 countries.